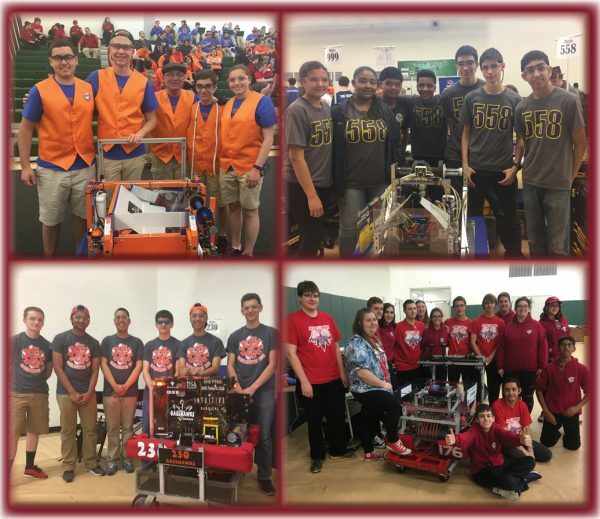 Capping a busy season for Connecticut’s high school FIRST Robotics Competition (FRC) teams, the Connecticut Association of Schools, in partnership with NE FIRST, hosted the fifth annual FRC High School State Championship on Saturday, May 13th, at Guilford High School. The championship provided FRC teams from the state’s high schools an opportunity to showcase the skills they’ve used to design and build their robots and participate in FRC events over the past ten weeks. Thirty-five high school teams from across the state competed in this year’s championship. After qualification rounds, the CyberKnights (Team 195) from Southington High School ranked 1st and selected the Elm City Robo-Squad (Team 558) from Hill Regional Career High School in New Haven and Aces High (Team 176) from Windsor Locks and Suffield to be part of its alliance. The three-team alliance fought through the playoffs without a loss and took home the state championship! Teams 195 and 558 have enjoyed a great relationship over the years, winning multiple events together and capturing the Connecticut title for the second year in a row! The full results of the exciting competition can be found at https://www.thebluealliance.com/event/2017ctsc. Check out the video below and see how participation in robotics can empower students with skills to transform the world!